This week’s blogger challenge theme is holiday gifts. Since we’re still celebrating Hanukkah, I thought I’d share a little gift idea I created that was published in this year’s Paper Crafts magazine Holiday Cards and More issue. 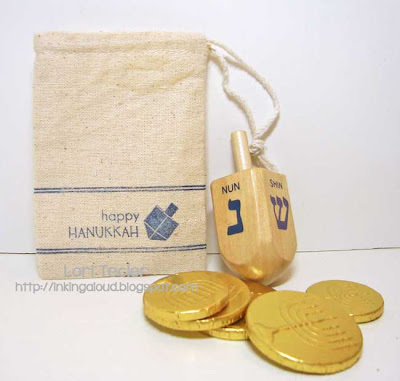 I used a small drawstring muslin bag to create a gift bag for Hanukkah gelt. The bag is stamped with a dreidel from the Hanukkah set from Clear and Simple Stamps. 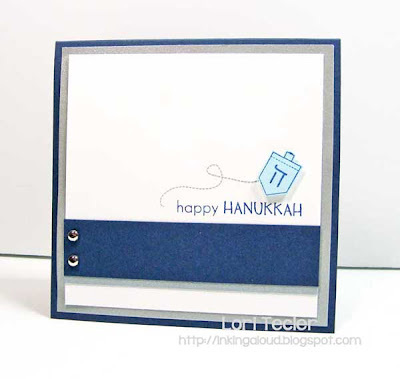 I combined the “happy” from the Icon Extras set and the “Hanukkah” from the same Hanukkah set to get the sentiment. One of the line images from the Create-a-Plaid set stamped above and below the sentiment and image adds a little definition to the design. To keep the ink from seeping through the front of the bag to the back, I put a piece of scrap cardstock inside of the bag before stamping. 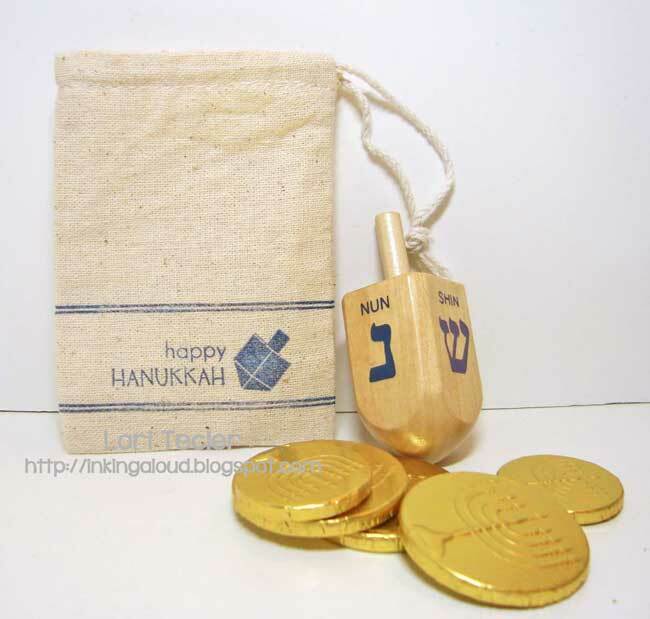 Once I’d finished stamping, I took out the scrap paper, then filled the bag with gelt (foil wrapped chocolate coins) and a small dreidel for a perfect little Hanukkah gift! I made a coordinating card to go with the bag, too. The square card has the dreidel image from the Taglines stamp set as the focal image. It’s stamped in dark blue ink on a lighter blue cardstock, then cut out and adhered to the cardfront with foam tape. I stamped the dotted trail image from the Taglines: Critters set in silver ink next to the dreidel to suggest that it had been spinning around. The "happy Hanukkah" sentiment is stamped underneath the dreidel. A strip of blue cardstock, accented with silver brads and a narrow silver cardstock border, finishes the simple design. The dreidels and the blue line elements tie the bag and card together nicely. For more holiday gift ideas, check out the link list below. And, feel free to create your own new holiday gift project and add it to the list.